On 27 June 2014 a one day conference was held at the Bulb Innovation Centre at the University of Kent, exploring how the Passivhaus, an energy efficiency standard for buildings originating in Germany, has been adopted in the UK. 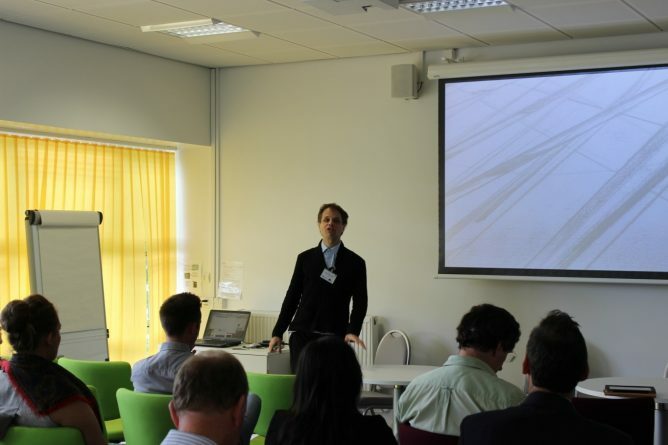 The event, which was fully booked, was organised by the project coordinator, Dr. Henrik Schoenefeldt, in collaboration with Emma Lansdell of the EU-funded Environmental Innovation Network at Kent Innovation and Enterprise. The aim of the conference was to disseminate the findings of the research project ‘Interrogating the technical, economic and cultural challenges of delivering the PassivHaus standard in the UK’ and to engage professionals and academics in a series of cross-disciplinary discussions about the challenges and potential strategies for adopting the Passivhaus standard within the UK. The attendees comprises largely of practitioners from London and the South-East, but also included some of the industry partners that have been involved in the research project continuously over the past twelve months. The event was designed to present the findings of the research to a wider audience and to engage practitioners and academics directly in a series of discussions about the challenges of introducing the Passivhaus standard within the UK. The coordinator of the research project, Dr. Henrik Schoenefeldt, gave the opening lecture, which provided an overview of the research project and some of the key areas investigated. The talk also included a reflection on the process of involving a team of students in collaborative research projects and engaging industry partners in the project through a series of workshops and project review sessions. This was an important part of the project, as one of the objectives of the project was to explore how far research projects can be used as a means to establishing collaborations between architecture students, industry, and university-based research. It is part of his effort to establish research and design as two pillars within the sustainability curriculum of the KSA’s MArch programme. Reviewing the process with the external partners, Dr. Schoenefeldt found that this model had worked well, but also that it required extensive coordination. The project enabled students, among others, to become familiar with different research methodologies to a high standard, giving research presentations and with producing a peer-reviewed research output in the form of an eBook etc. The involvement of practitioners was found to be particular fruitful is allowed the research team to develop the type multi-disciplinary perspective that was required to fully understand process by which project teams had adapted in order to successfully implement the PassivHaus standard. Professor Gordana Fontana-Guisti from the Kent School of Architecture giving the welcome speech (left) and Adam Nightingale presenting a case study on the Rural Regeneration Centre at Hadlow College, Kent. Over the course of the day, the team of students who have been involved in the project for twelve months, presented ten case studies in three thematic panels, (1) new housing, (2) retrofit and (3) educational buildings. Each panel was followed by chaired discussions, exploring the significance of some of key findings of these case studies. The case study presentations were followed with great interest and led to a series of interesting discussions concerning the application of Passivhaus principles to new and existing housing as well as educational buildings. (2) negative prejudices towards Passivhaus, e.g. airtight boxes in which windows cannot be opened (3) an overly risk conscious and conservative construction industry (housing), reluctant to adopt or develop new methods of construction and the absence of (4) a mature supply chain of compliant components within the UK. He also stressed that architects are required to communicate the advantages of Passivhaus more effectively, including energy efficiency, ‘comfortably warm and draft-free’ interiors, and ‘fresh’ indoor atmosphere. The later provided particular benefits to people with asthma. In the second part of his talk he talked about some of the techno-economic barriers in the UK. Criticizing the reluctance of the UK building industry, in particular in the housing sector, to adopt new methods of construction, Philip argued that timber-based construction systems, prefabricated in factories, provide a means to deliver the required standards in a more cost-effective way. Through a series of Belgium and Dutch examples, he showed how these systems provide a means to adapting the PassivHaus standard for a mass market, including the volume house sector or large scale commercial office buildings. He showed that timber-based system are versatile, as they cannot only used in large- and small-scale project, but also for retrofit existing structures. First guest lecture by Philip Proffit, Princedale Housing, exploring some of the broader techno-economic challenges of low-energy design. He stressed that the UK are gradually moving towards a fabric first approach, but too slowly. He stressed that there was a misconception that it would be cheaper to deliver lower fabric efficiency standards, but in reality, he argued, poorer standards can make buildings more complicated and expensive, largely due to the cost for additional backup heating systems required. If a space heating demand of 15 KWh per square meter or less is achieved, research at the PassivHaus Institut has shown, a conventional heating system is no longer required to maintain comfortable conditions. In his talk he included many references to the city of Brussels, where the PassivHaus was made the mandatory energy standard, giving a boost to investment into technical innovation and employment within the Belgium construction industry. This, he highlighted, illustrated the potential role of regulation can play in driving the UK towards significant increases in energy efficiency or investment into deep retrofit measures in the UK. In the discussions following in the afternoon various attendees argued that setting clear mandatory performance standards will be a positive step forward, even if the standard is high, as it would provide the industry with a clear set of benchmark to which it can comply. The second Keynote lecture was given by Derrie O’Sullivan from Huddersfield, who had experience with PassivHaus in practice as well as education. In his own project he explored how the Passivhaus standard buildings can be achieved using traditional craft skills and methods of masonry construction. Derrie advocated the idea of Passivhaus embracing craft traditions, which contrasted with Proffit’s more industrial approach to building production. Referring to his experience with studio teaching at the University of Huddersfield, he also discussed some of the difficulties with introducing Passivhaus and low-energy design principles into the traditional design studio of architectural schools. One of the problems, he noted, was the lack of appreciation in architecture schools for the type of technical rigor underlying the design of low-energy buildings among design critics or studio tutors, who would evaluate student work on different criteria that are used in architecture school in the assessment of design projects. Taking the attendees through various architectural projects in Germany, he illustrated the variety of ‘architectural forms’ PassivHaus standard buildings can or could take. In the case of the latter, he referred to the Peter Zumthor’s Kolumba Diocesan Museum in Cologne, which was not designed to Passivhaus standard, but due its compact form and glazing to wall, could potentially achieve the standard without significant alteration to its architectural form. The event ended with a final plenary discussion, exploring some of the broader questions raised by the research. One of the big questions that were discussed was whether Passivhaus required a revolutionary or evolutionary approach. Some developments followed the premise that the delivery of low carbon buildings require a fundamental change in technology and the UK construction industry, whilst others explored ways of adapting existing methods. Concluding from this discussion, Paul Mallion from Conker Conservation, stressed that this shows that Passivhaus does not prescribe any particular method of construction. The variety of construction methods used in the case studies covered in the research project illustrated that any mode of construction can be used if the passivhaus principles are rigorously followed. Paul, Philip and Derrie also stressed that it was possible to deliver Passivhaus standard buildings using largely UK skills and suppliers. The current standard of vocational college education in the UK was also seen as a major obstacle, which tend to provide only basic skills and to focus on traditional methods of construction, rather than cover more advanced and modern methods. It is all about the relationship between the various disciplines involved in the design, implementation and use of the buildings, not only those involved in the design development but also in the construction and use of buildings. Referring to the findings of the research project and his experience with practice in Austria and Germany, Dr. Schoenefeldt argued that establishing stronger links between the education of the ‘designers’ and ‘makers’ of buildings would be an important step towards exploiting the full potential of cross-disciplinary project teams. Various attendees of the conference noted that establishing good project teams is hard work and that maintaining these teams after the completion of a project would allow them not only to delivery projects more effectively but also to further develop their knowledge base and body of practical experience. The latter is particular important in the context of low energy design, where new modes of practices have to developed involving all parties involved. The problem in the UK is that teams tend to be broke up after each project, despite previous efforts to build a team with the necessary knowledge, experience and skills. All of the projects made apparent the importance of learning from mistakes and openly sharing experience within the wider industry, including the exchange of technical knowledge, solutions adopted in different projects, and the practical insights gained through real-life projects. This, however, was found to requires a major culture shift as practice, being concerned about their reputation and with maintaining a competitive advantage over other practices, tend to be resistant to openly share their knowledge. This illuminated that the UK built environment, if it is to overcome the various challenges with delivering zero-carbon buildings, needs to reengage with the role of collaboration and competition in innovation.